Ginsberg’s The fall of the faculty: The rise of the all-administrative university and why it matters, serves as a sounding board for a larger discussion about the roles of academic and administrative parts of the university community and ultimately the value of a university education. We have a good idea of what the all-administrative university might look like, but what would the “all-faculty” university look like and how would it function as we pass further into the 21st century? under terms of fair use. I am going to start with a little warning. This is a long posting and is perhaps a little self indulgent and rambling. During the past few days I read The Fall of the Faculty: The Rise of the All-Administrative University and Why it Matters by Benjamin Ginsberg, and although I recognized during my reading that it has merit, I did not care much for its presentation. I am not reviewing the book. Although I read the book completely, I did not read it thoroughly enough to write a review or with the intent of doing so. I am just providing some of my impressions about its execution and its principal messages, while also recognizing the importance of the topics Ginsberg addresses in general. I would like to acknowledge that, to a lagre extent, I have glossed over the root causes and attitudes that have created conditions fertile for the corporate-university, which I find intriguing. First here is the frustrating part. While reading the book, I definitely got the impression that virtually all maladies at the University can be traced directly to administrators. Although lip-service was paid to the occasional good administrator, and Ginsburg acknowledged that all members of the faculty are not equal contributors to the academic community, and some (the worst of the faculty lot) are even administrative collaborators, for the most part all of us were thoroughly archetyped. Following from the American Western, in this book everybody wears black or white hats or might as well. University administrators are bad guys or buffoons and are grouped together as deanlets and deanlings. The administrators have “staffers” who are not all bad, but probably have no place at the University while serving the ambitions, waste, and bloat of administrators. Full-time faculty are clearly good, while adjuncts could be better, and most students are good as well... even if the students are athletes... unless they play basketball or football on Saturdays, in which case they are "big dummies." Picking up the book was kind of convenient. Although I have owned the book for some time without reading it, I was inspired to do so because of a reference to the book in the OER Foundation’s Open content licensing for educators seminar (#OCL4Ed). During the first session, the facilitators asked a question about whether teaching is a “profession” or a “vocation,” which generated a lot of interesting discussion. Early in the discussion, a thread titled “Fall of the Faculty / The All Administrative University” was started by a colleague from Kwantlen Polytechnic University in Vancouver, BC. I made a few comments in the thread and decided to pick up the book and read it. Before going on, a sense of fair play and respect for whoever might read this demands full disclosure. Although I have never boasted a deanlet or deanling title, I have served a number of universities in administrative and “staffer” capacities. My last few titles have included director, executive director, CEO, and now DVC and CIO. I have also taught in the classroom and online for nearly 20 years, but always as a contingent member of the faculty - sometimes full-time and sometimes part-time, but in any event, I have never faced the rigours of the tenure track. resonate well with me, even if in the book the causes all lead predictably to the same place - the administration, and the implication that there is some sort of conspiracy at hand. That as a group, administrators are systemically plotting together, perhaps across institutions a quiet coop. What did not resonate with me was the oversimplification of an exceptionally important topic. Unlike A. Bartlett Giamatti in A Free and Order Space, who very eloquently frames the interplay of academic and administrative functions at the University in terms of “the academic mission,” Ginsberg seems to be more interested in setting the stage for a confrontation in which academics and administrators are pitted against one another. Even if the intent was good and the art was bad, Ginsberg should have had the sense to not over-generalize. Once again, unlike Giamatti, who spoke specifically of Yale, Ginsberg is all over place, applying his standards from elite private universities, to liberal arts colleges, regional public universities, and community colleges. In my opinion, the net was cast far too widely and it weakened his overall argument. It is not fair or I think intellectually honest to use examples of administrative activity and organizational structure from a community or regional public college to make a point about the “all-administrative university” from his personal exposure to some pretty elite private traditional research universities. Once again, I am frustrated because the topics of university cost structures and relationships between full- and part-time faculty and administrators with each other and with students in relation to the institution’s mission are of critical importance. And they represent issues and challenges that need to be addressed with mutual respect, putting our key stakeholders first. ...that since 1990, in both public and private colleges, expenditures on instruction have risen more slowly than in any other category of spending, even as student numbers have risen. Universities are, however, spending plenty more on administration and support services (see chart 2). Please note that this graphic is not open content. I am using it under terms of "fair use." Chart 2 is titled Plenty of Padding and it refers to numbers of employees not spending as is stated in the quote. The units of measurement do not match reducing the value of the chart. In addition, it provides a vague (not specific enough) reference to “The Department of Education; National Center for Educational Statistics.” Furthermore, I am not sure if the terms “college” and “university” are being used interchangeably in this article. I simply have no way of knowing. This seems like just plain sloppy work on the part of the Economist. Back in the classroom this type of reference, absent a citation, would have earned the author a lecture on the importance of helping your reader know what you are talking about, allowing the reader to fact find, and the ethical nature of applying appropriate attribution standards. That said, I would have given the author a “do over” with the opportunity to clear up some of the inconsistencies. faculty ranks more than kept pace with student enrollments from 2001-2011. Once again, I am in no way suggesting that these numbers are good or appropriate. In fact, I am not even sure what the numbers mean relative to the purposes and missions of the sector and individual colleges and universities. For example, what would these numbers look like if we started including the faculty and enrollment numbers that are common in MOOCs; that is, when some universities start using MOOCs as part of their regular curriculum and offerings? Obviously Ginsberg has no control over the way popular media reports on higher education. 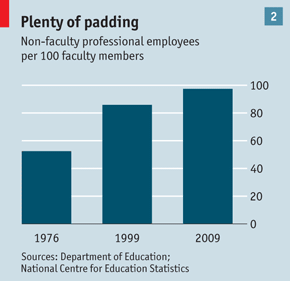 I do not mean to infer a connection between the Fall of the Faculty and articles like those in the Economist. I wanted though to point to the fact that the issues being discussed are politically charged, the data require subtle treatment, and popular media is frequently not the best place to turn for accuracy and clarity. Are Some of the Things we are Doing Valuable? I think though that the numbers as they stand can be put into some perspective. Although I have no data to support this, I do believe that we have seen a reshaping of staffing at many post-secondary institutions not just more of the same-old. Once again, this is just common sense, but when you consider the changing demographic that we are serving across the sector, the push to increase access, and the growth of distance education, we can see increased needs for student and faculty support in at least the following areas. Remember, in 2001 a small number of institutions had institutional learning management systems, never mind electronic library and research resources, ePortfolios, social media, and other digital assets that are now considered just part of functioning in the 21st century. The number of non-traditional and adult learners and those studying at a distance was much smaller and was concentrated at relatively few colleges and universities. Most institutions have built infrastructure and resources to accommodate the growing populations of returning and remote learners. Is this right, are these good investments? It depends on the type of school you are considering, the institution's commitment to access, and its self-identity. Perhaps, as Ginsberg clearly states, it is not right for Johns Hopkins University. Regardless though, reliable technology-based systems are now an expectation. As an undergraduate I remember spending more than 2-days leading into each semester standing in lines to register for courses. We would line-up hours before the faculty member would show up at their designated classroom, so we could sign-up and get into their course. I can't imagine that many of the faculty felt this was good use of their time either. Now registration takes seconds to execute. Faculty time is spent advising the student and supporting academic development, not managing a queue. It takes a team of technologists to support these very helpful administrative systems, and they were, for the most part, absent before the 90s. How about the All-Faculty University? I would like to acknowledge though that I think the real points of Ginsberg’s book are most weakly made in terms of finance and staffing. I think that that they are most strongly made in terms of control and governance of the academic enterprise and the assumptions that we make about the purposes of the University. Ginsberg’s point that academic freedom is critical to the purpose of the University and that without tenure, there is no academic freedom is powerfully made. I do see that tenure is under siege both within and outside of the University. I see few university administrators clearly articulating the value of tenure and academic freedom, while articulating the practical importance of a liberal education as the University pursues its mission. At the end of the day though, even though I was frustrated, the Fall of the Faculty struck a chord. Kudos to Ginsberg for providing solutions. In many ways, he is suggesting that we return to the old ways. Rebalance the roles of administrators and faculty. I think that this is an excellent suggestion. It is perhaps a recommendation that is not practical for every post-secondary school to follow, but it clearly has a place in the incredibly diverse landscape of higher education. In reality we have seen the manifestation of the “all administrative university” with the rise of the for-profit chain university. I don’t think that many of us liked what we got, but like Ebenezer Scrooge we did get a glimpse at a potential future. In response, why not build the “all-faculty university,” and see how that goes in our current environment and as we prepare for the mounting challenges and opportunities of the 21st century? It would be better to not have to build one from scratch, but by the sounds of it, there are not many universities available that have not been infected by the administrative virus. Perhaps though some universities will give a fair hearing to the idea and come back home. Perhaps some exist and we need to learn from them. I am sincere about this. I would like to see a college or university that followed in earnest the values and priorities that Ginsberg has promoted in his book and I hope that there is still a place for it in the spectrum of post-secondary education. It would even be better if it were affordable, appealed to students, contributed to the common good, and we knew if it was delivering on its promise. "...will not oversee something that isn't of high quality. ... It won't happen under my watch," she says. "If you knew me and our administrative team, we go to great lengths to ensure that what we're doing has rigor and quality. "If that means hiring someone full-time whose job is to make sure that every class is not substandard, or to make sure we integrate technology to watch students as they take exams, that's what we will do." Would we not legitimately expect, as Ginsberg clearly would, that the person ensuring that a class is not substandard be the faculty member? Would we not expect this as a student or a parent? I am guessing that different people would respond to this question differently, but I think that it strikes at the larger question raised in the Fall of the Faculty. It is the type of question that ought to be discussed openly and civilly. It is the type of question that needs to be framed in terms of institutional mission, alongside the expectations that are being placed on the sector and the expectations we have for different types of colleges and universities in different parts of the sector.